You are undoubtedly besieged with e-mails, phone calls and texts this morning after last night’s debacle featuring your replacement refs literally handing the ball and the game to the Seahawks over the Packers in front of a national television audience. It’s probably not the best day for you, but then again, your worst day at work is still probably better than most peoples’ best day at work, so you’ll get no sympathy from any NFL fans, except maybe the ones living in Seattle. The hypocrisy to your approach with the refs is as great as any politician running for election this year. You claim that your mission is to protect the players and the shield, yet your replacement refs are putting both of those in serious jeopardy. Thankfully, the only major damage so far has been to your reputation. What is it going to take to get you to do the right thing, and pay the professional refs what they deserve? A paralyzed NFL player? A stadium riot? 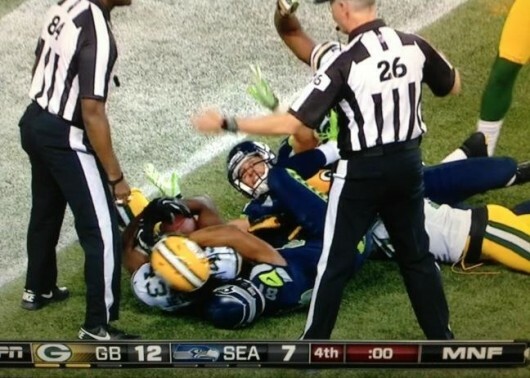 If the Packers would have been on the receiving end of that horrific call last night, and the Seahawks lost the game because of it, how do you think the fans would have reacted? All it would have taken was a handful of drunk fans to overreact to the outcome of the game, and a melee would have most likely ensued. You have a product that America craves, so you probably think that you can do whatever you want and we will still keep supporting the NFL without fail. You are wrong to think this way! There is already talk of people boycotting the game in Green Bay next week. Green Bay! Those are some of the most loyal sports fans in the world. The fans own the team, and they are thinking about boycotting to send a message to you and the NFL. If you think that the NFL can’t fall from its lofty perch, you should take a look at how long it took Major League Baseball to come back after their extended work stoppage. If not for Cal Ripken’s consecutive game streak, there wouldn’t have been much interest in the game at all. The NFL has always been special because every game carries so much weight in a relatively short season. Whether you would like to admit it or not, much of the popularity of the game is generated by gamblers and fantasy football players. If those groups start to decline, your ratings won’t be far behind, and the absurd television deals that put millions of dollars into your pocket each year will start to decline as well. NFL fans love the game in spite of the greed of billionaires, and an extremely well-paid commissioner because it gives us an escape from the stress of everyday living. However, when the games are no longer enjoyable to watch, the NFL will start to lose money. Personally, I would not set foot inside of an NFL stadium while the replacement refs are still ruining the game that we all love. Nor will I be buying anything with an NFL logo on it. I can’t make a difference on my own, but I assure you, Mr. Goodell, that there are others out there who feel the same way as me. And in the day and age of social media, you shouldn’t underestimate the power that people have when they join forces. Pay the refs what they deserve because it is the right thing to do. You are a wealthy man, Mr. Goodell, as are the owners that you represent. I’m sure that you all drive expensive cars that you get detailed professionally rather than going to the squeegee guy on the corner who is going to clean your car with spit and newspapers. I’m sure that you all live in nice homes and frequent fine restaurants, and that you insist on quality in every aspect of your lives. So why is it that you feel that it is perfectly justifiable to settle for the lowest possible quality officiating of the most popular sport in the world? You say that you want to protect the shield? Then bring back the professional refs, because these replacement refs are more of blight on the game than anything that happened with the Saints and “Bountygate,” and we all know how swiftly you acted in that instance! When the second tower was hit on 9/11/01, every citizen of the United States was affected. At that moment, our age of innocence was gone, replaced by an everlasting threat of terrorism. And though we have since eliminated Bin Laden and many other terrorist leaders, the fact remains that we are not immune to future attacks. Having personally experienced 9/11 from a very close vantage point (My 9/11 Experience), my perspective may be different than that of other people. But there is one thing that cannot be disputed…we were never closer as a nation than we were in the days, weeks and months following the 9/11 attacks. During that time period, we weren’t defined by our politics, our religion, our race or any other factor that has contributed to the divisive nation that we are living in now. 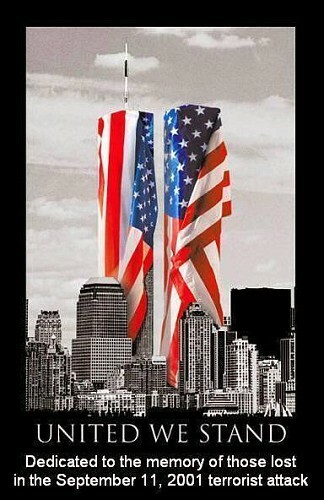 Though tragic beyond words, the 9/11 attacks, in my opinion, made us all better Americans. It saddens me that it took a tragedy of epic proportions to strengthen our bond, and saddens me even more that the passage of time has allowed those bonds to be shattered because we cannot agree upon what is best for the country going forward. Perhaps the divide was always greater than I realized, but it wasn’t as apparent before the 24/7 news cycle became so prevalent, and virtual soapboxes became so easily accessible through the use of social media. On the anniversary of 9/11, we throw around phrases like “Always Remember” and“Never Forget” as our way of honoring the innocent people who lost their lives on that tragic day 11 years ago. Our appreciation for the heroes of 9/11 comes to the forefront, as does our military pride. We fly the American flag proudly, albeit at half-mast, to show just how patriotic we are. But with less than two months to go until the presidential election, the red and blue colors on the flag are more representative of our differences than our similarities. Barring any vote-counting controversy, we will know who our President is going to be no later than November 7th. On that day many Americans will celebrate, while many others share in their disappointment. Some Americans will be disenchanted no matter who wins the election, while others who have given up hope will just continue to live their lives the best that they can. On the anniversary of 9/11, we “always remember” to grieve for the innocent Americans who lost their lives, and for their families as well. On the anniversary of 9/11, we “never forget” that many other military lives have been lost in the wars that we have fought since that day to defend our freedom. Imagine what America would be like if we “always remembered” the bonds that were formed in the wake of 9/11. Imagine what America would be like if we “never forgot” that there are people suffering to this day from 9/11 and its aftermath. Imagine what America would be like if we “always remembered” that we are all Americans, regardless of who we vote for in this election. Imagine what America would be like if we “never forgot” that a nation united is much stronger than a nation divided. On this, the 11th anniversary of 9/11, I reflect on my memories of that day as I have for the past 10 years, while hoping that we can find a way to bind together once again as a nation because it is the right thing to do, and not because we have suffered yet another unspeakable tragedy.